An antique pocket watch repair service should not be carried out by just anyone; these breathtaking, fob-style timepieces have an inherent value to protect and internal mechanisms that many jewelers and horologists are not accustomed to maintaining. Vintage pieces such as these require the services of a master craftsman with the credentials and training that would include antique pocket watch repair procedures. At Grover Service Centre, our timepiece technician has accumulated over 50 years of experience after having been trained by horology masters in a Swiss watchmaking program. 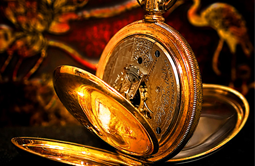 For over 15 years, Martell Grover has proudly provided the Rexburg, Idaho community with the finest antique pocket watch repair services and highest level of customer service available. Not only will your vintage timepiece receive the gentle, expert care that Grover Service Centre is renowned for, but our maintenance procedure will ensure your chronometer will continue to appreciate in value. If you are in need of a master craftsman to refurbish, restore and calibrate your family heirloom to its former glory, look no further than Grover Service Center. We clean, replace and maintain internal mechanisms and enhance delicate timepiece movements with a combination of the most advanced technology and old world skill available in Rexburg, Idaho. Our antique pocket watch repair service will sustain the unique aesthetic beauty and vintage charm of your beloved timepiece that you will be proud to own, wear and bestow as a family legacy. Call or stop by today to find out more about our workshop. Grover Service Centre is an honored member of Jewelers of America, one of the top national resources for jewelry industry professionals and its valued patrons. The American Watchmakers-Clockmakers Institute (AWCI) is the top organization in the United States that is dedicated to the horological industry. Their primary goal is to promote the highest standards of excellence in the timekeeping arts. Grover Service Centre is a proud member of AWCI. Grover Service Centre is an esteemed member of The National Association of Watch and Clock Collectors (NAWCC). Since 1943, NAWCC has served as a non profit organization dedicated to providing unique educational, cultural and social resources that share the art and science of watchmaking and timekeeping.